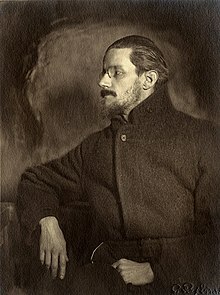 James Augustine Aloysius Joyce (2 February 1882 � 13 January 1941) was an Irish novelist and poet, considered to be one of the most influential writers in the modernist avant-garde of the early 20th century. Joyce was born to a middle class family in Dublin, where he excelled as a student at the Jesuit schools Clongowes and Belvedere, then at University College Dublin. In his early twenties he emigrated permanently to continental Europe, living in Trieste, Paris and Zurich. A Portrait of the Artist as a Young Man is a semi-autobiographical novel by James Joyce, first serialised in the magazine The Egoist from 1914 to 1915, and published first in book format during 1916. The story describes the formative years of the life of Stephen Dedalus, a fictional alter ego of Joyce and an allusion to the consummate craftsman of Greek mythology, Daedalus. The novel traces the intellectual and religio-philosophical awakening of young Stephen Dedalus as he begins to question and rebel against the Catholic and Irish conventions with which he has been raised. He finally leaves for abroad to pursue his ambitions as an artist.